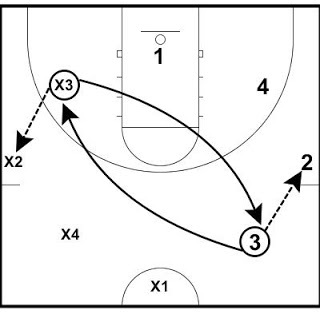 Here is an idea if you for a conditioning drill that also involves handling the basketball. The drill continues in similar fashion for one minute on the clock. If the ball hits the ground, passes are not caught cleanly, traveling, or any other error, the one minute is put back on the clock and the drill starts over. Or, you can add time each time there is a turnover. You can change the time or the requirements to complete the drill without starting over to fit your needs. In addition to the diagrams, there is a video below of the Maryland Women’s team running the drill. 8 players are in the drill. Players of same numbers are partners. 1 is matched with x1, 2 is matched with x2, 3 with x3, 4 with x4. 1 and x1 each start with a basketball. The drill starts out with the players who have the basketballs passing to their right. 1 passes to 3 and x1 passes to x3. After making the passes, the 1s sprint and change spots. Players need to be aware of the other players in the middle to avoid collisions. 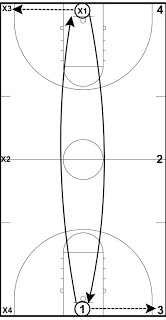 The 3s, then change positions. If the ball hits the ground, passes are not caught cleanly, traveling, or any other error, the one minute starts over. 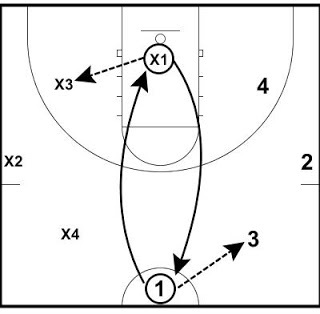 The drill can also be done full court. 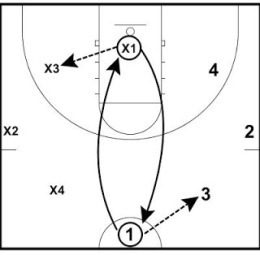 In the full court version, obviously the players at half court have a shorter distance to run and the players in the corner have longer to run. If you have more than 8 on your squad, you can put players behind in the corners and under the basket (so that you have 2 in each of those spots) to make the running more equal. 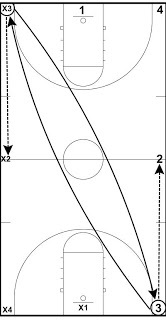 Below is a video of the Maryland Women’s team running the drill full court. I like the idea of keeping the players inbounds, but if you want them to run a little more, you can station them behind the sideline. This is an awesome drill for court awareness too!